Today I had a unique experience. I was driving a friends 1916 Touring. We had just turned out of a side road onto a main road and shifted into high gear when we heard a loud cracking sound. We both simultaneously heard the noise, looked at each other and blamed it on body flex and dismissed it as wood flexing. I arrived home tonight to an email from the owner saying when he put the car away the brake light was still on. The switch was out of alignment with the pedal shaft and the engine/trans assembly had rotated around enough to wedge the exhaust pipe in the chassis rail. Luck we got home without further damage. Could have been real nasty if we had been further away from home on one of our regular extended tours. I hope he will add a picture when he sees this??? Thats an experience that makes the hair on the back of my neck stand up. Although I've never experienced it, several years ago I began buying up enough accessory pan supports to install on all my Ts. To replace a pan arm requires engine R&R, thoroughly cleaning of the pan and some fairly difficult riveting and brazing. Those 2 'pan ears' must've endured some dynamic stressing over the last 100 years and something as simple as a 'pan brassiere' addition could really alleviate a ruined tour. "Pan brassiere"! Very descriptive name! I guess that a couple of twists of bailing wire around the frame and transmission will not be enough to fix the problem. i welded mine back together with the engine in the car, but mine had only suffered a crack on the ear part at the top. In the shop for a repair, 95% clean as a whistle, snapped like a carrot, lucky that the exhaust pipe hit the chassis rail and stopped the engine from falling further. I can't blame that it's a 99 year old part or that the lower bolt and wood block is missing, it would have to be that #@X*#@&- E timer, the extra torque just ripped that sucker apart!! Sorry Frank, didn't mean to break it! thanks for the picture. Nice to know where the noise really came from! Its not raining, so I might go for a drive in my T! Frank, that is an easy fix without replacing the arm. With the engine out, but pan still fitted, I would Vee the crack a bit from the top and mig weld it up again. Then make two right angle pieces of steel rod to lay in the underside grooves and weld bronze these in place. They cannot be seen when installed, and will greatly re-inforce the pan ear. Believe me, it works really well and saves a lot of work replacing the pan. I do not see the bolt thru the side of the frame. 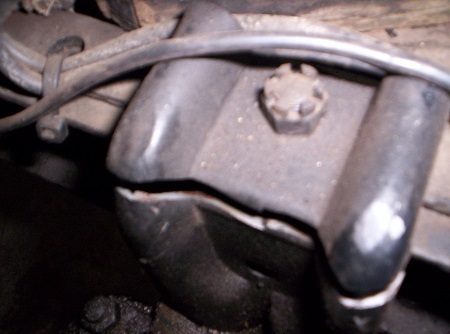 To me this is evidence that you should use both bolts in the engine mounts. Want to miraculously decrease vibration? 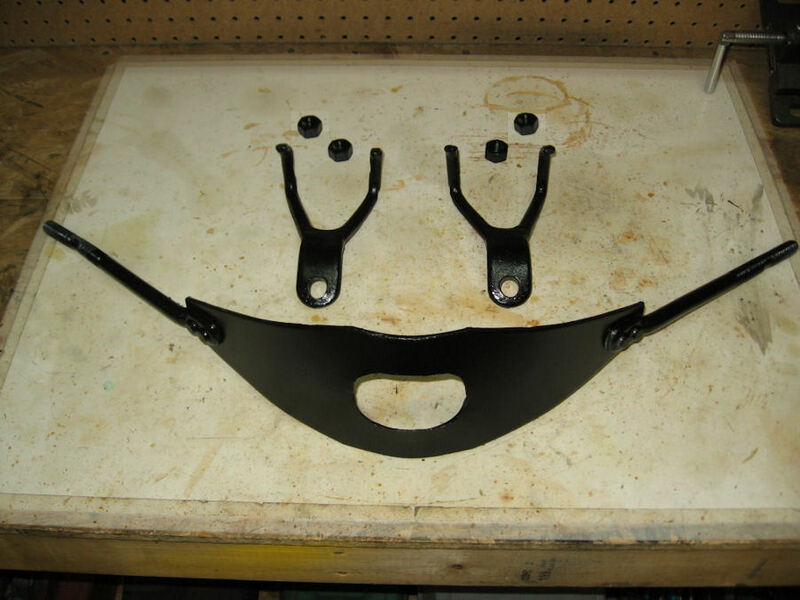 Mount the 2 pan 'ears' on a rubber pad similar to late radiator mounting pads. I use an old tailgate mat.